New York painter Patti Mollica splashes paint across her canvas with bravura brushwork and a joy of color that is both inventive and completely fearless. After studying at Syracuse University, Mollica developed a career in graphic design and illustration. Her interest is in capturing the vitality of the scene or object that she’s painting rather than rendering it literally. To that end, she works in an abstract, painterly style using quick, loose brushstrokes. Starting out, she works from a black and white sketch with about five colors, painting big shapes and gradually breaking them down into smaller shapes. In her unique methodology, she paints while turning the canvas clockwise so that before she begins painting the subject matter, she has achieved a strong design that works from whatever angle the painting is positioned. Her concept is based upon the idea that if the underlying abstract shapes work compositionally, the painting on top of it will hold together. With this powerful compositional underpinning, she works with large brushes, overcoming inhibitions by focusing on the big shapes. She works quickly so that there’s no time to “sweat the details”. Patti Mollica believes that truly great painting is not about the “subject matter”, but rather about the way an artist communicates beauty, sensitivity and integrity. For her, flowers, gardens and sunsets are no more worthy as painting subjects than a subway station full of weary commuters or a closeup of an old rundown building with cascading fire escapes. She believes that the painter’s job is to show the viewer the inherant beauty of all subjects, most especially those that are not commonly thought of in an poetic light. The urban environment provides her with endless opportunities to seek the hidden city soul. This is the heart of her artistic inspiration. Mollica’s work has been acquired in numerous public collections including Mellon Bank USA, Société Génerale, Daimler Chrysler, and Sheraton Hotels. 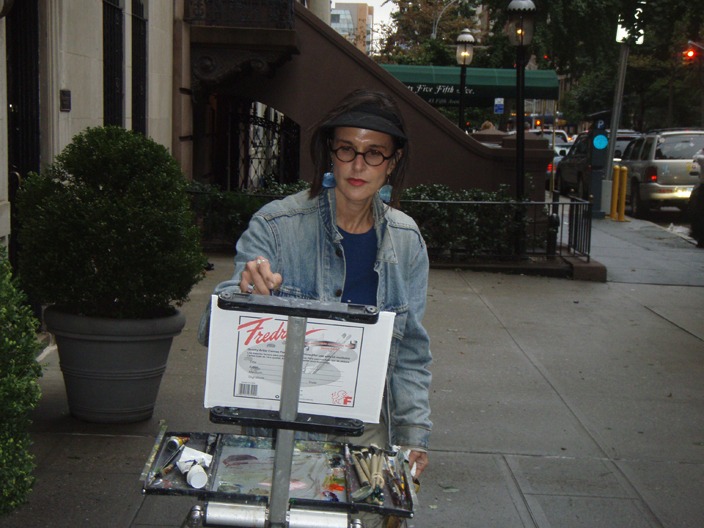 She has participated in many solo and group shows in New York and New Jersey and has received numerous awards and scholarships, most notably two from the Pastel Society of America and the National Academy of Design. She has twice won the Award of Excellence from Manhattan Arts International. Patti Mollica’s work is distinguished for its bold brushwork and color, its unique, creative design and its very contemporary flair. She currently lives and works with her fellow artist and jazz musician husband in New York City and in Nyack, New York.